Self-driving vehicles could roll this winter from tucked-away test tracks to one of the most publicized events in America: the Super Bowl. 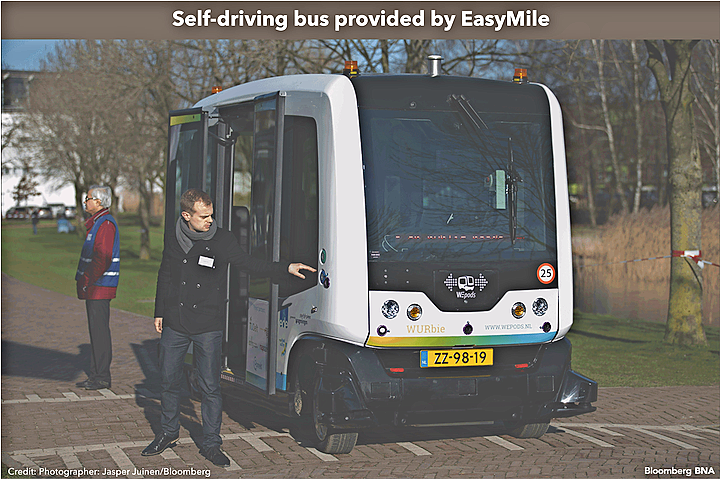 The Minnesota Department of Transportation (MNDOT) selected EasyMile, a French company that makes self-driving technology, to supply buses for testing the technology’s capabilities in the state’s snow and ice in February 2018. The first tests will be in a closed facility. The second testing phase would dispatch the buses as shuttles along pre-programmed routes on public streets, closed to other vehicular traffic— just as thousands of people pour into the Twin Cities for Super Bowl LII. Buses with no human operators or steering wheels will be able to shuttle people to and from hotels and festivities, if the National Highway Traffic Safety Administration grants EasyMile and Minnesota a waiver from the Federal Motor Vehicle Safety Standards. Vehicles operating on public roads are currently required to have a steering wheel. Companies like Alphabet Inc.'s Waymo, Uber Technologies Inc. and Ford Motor Co. are innovating and testing in Arizona, Pittsburgh, and Mountain View, Calif., to ready self-driving technology for the market. MNDOT was in the process of signing its contract with EasyMile as of Sept. 5. The Transportation Department wanted to raise awareness among state politicians and regulators of the potential of self-driving vehicles, according to Minnesota’s Autonomous Bus Pilot Project Director, Jay Hietpas. “The Super Bowl, we thought, was a great draw,” said Hietpas. NHTSA released the Federal Automated Vehicles Policy in September 2016. Transportation Secretary Elaine Chao has said the agency hopes to provide a policy update, which industry groups anticipate by mid-September 2017. The current federal policy is a set of principles—what has been referred to as a “soft law"— that largely restricts the federal regulatory role to vehicle safety. DOT’s policy cedes to states and localities the decision about whether to allow testing on public roads, to allow public riders, and other issues. The federal government has a balancing act to perform when it comes to regulating emerging technologies like self-driving vehicles—showing that regulators are on top of the issue without implementing rules prematurely, according to Joshua New, a policy expert at the Information Technology & Innovation Foundation’s Center for Data Innovation. “The industry is working on these technologies, is deploying, and the agency is monitoring the situation making sure that if something gets deployed and it introduces unreasonable risks to safety, then the agency can conduct an investigation, intervene, pull cars off the road, conduct a recall,” said Chan Lieu, a partner at Venable and a spokesman for the Self -Driving Coalition for Safer Streets. Several states have taken the lead in allowing autonomous vehicles tests and in regulating the technology’s use on public streets. “The states are definitely positioning themselves to be as attractive to testing as possible. I think that’s practical from an economic development perspective,” Lieu said. Minnesota’s testing will not end with the Super Bowl. Instead, MNDOT included in its request for proposals the possibility of doing a veritable road show—allowing other cities in the state to request their own public demonstrations of the self-driving buses. While the industry waits on updated guidelines from DOT, it is listening closely to comments from leaders like Chao, who has called on the industry to do its part to raise public awareness and make a case for the technology. Much of the benefit for autonomous technology will likely be felt in less public-facing sectors like trucking and logistics, New said. But public transportation is also a possibility, making MNDOT’s Super Bowl testing a good opportunity to engage future users. “The technology is not necessarily designed to take you from Washington, D.C., to New York City. It’s designed to shuttle you around a geographically-defined area and so with the Super Bowl we have a pretty well-defined space,” Lieu said. MNDOT’s test bus, which will operate on a pre-programmed route, will have a person in the vehicle at all times to monitor the performance and step-in if needed, said Hietpas. “The sooner the public can experience the technology, understand the capabilities and how reliable it is and how sophisticated it is, the sooner they are more likely to develop the confidence that the system is fairly robust and it’s much more sophisticated than what it is compared to, which is your computer,” said Lieu.